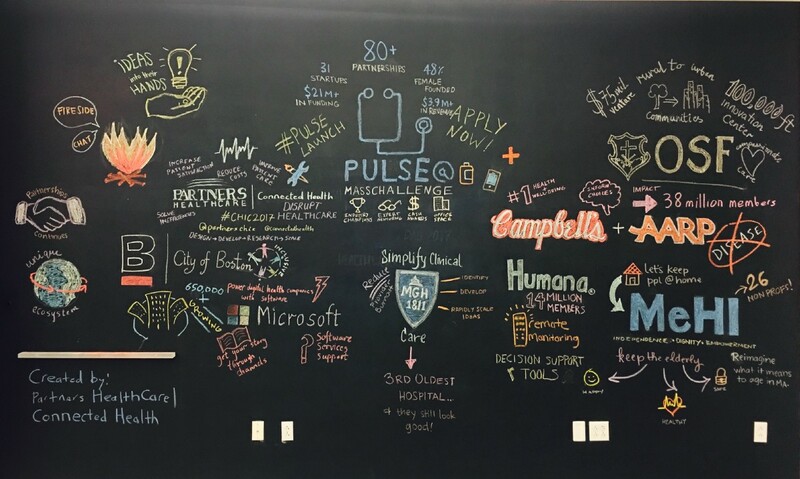 Apply to join PULSE@MassChallenge before October 10th, 2017. It was July 7th, 2016. 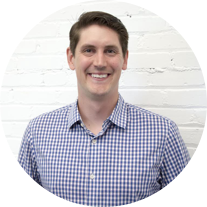 We needed to figure out what PULSE@MassChallenge, a digital health lab launched as part of the Massachusetts Digital Health Initiative, was going to be and what it should accomplish. We had to both design and launch applications for the program by September 14th. The clock was ticking. We immediately contacted as many entrepreneurs and industry experts we could get our hands on. One thing was immediately clear — everyone wanted to solve healthcare’s massive challenges. With myriad challenges comes commensurate solutions (at least in quantity). It doesn’t matter how good your solution is, if the customer/partner has no budget and if there’s no priority for them, you don’t have a paid adoption in year-one. You get funded for 12–18 months. But you won’t see meaningful revenue until month 24. What do you do? We discovered in our research that a consistent way to turn an average 24-month partnership cycle into a 6-month cycle for startups was to align a solution to strategic initiative. Even then, it’s not a guaranteed path to success, just a lot better than the alternative. …and when they do, they’re so inundated with interest, it’s near impossible for them to cut through the noise and hear what you have to say. If PULSE’s goal is to help startups win (so that patients win — i.e. massive challenges solved), we asked “what can we do to manufacture winners?” Rather than focus on funding, we would focus on partnerships. If we turned 24-month processes into 6-month processes consistently, we would get our victories. Funding or revenues (even better!) would follow. 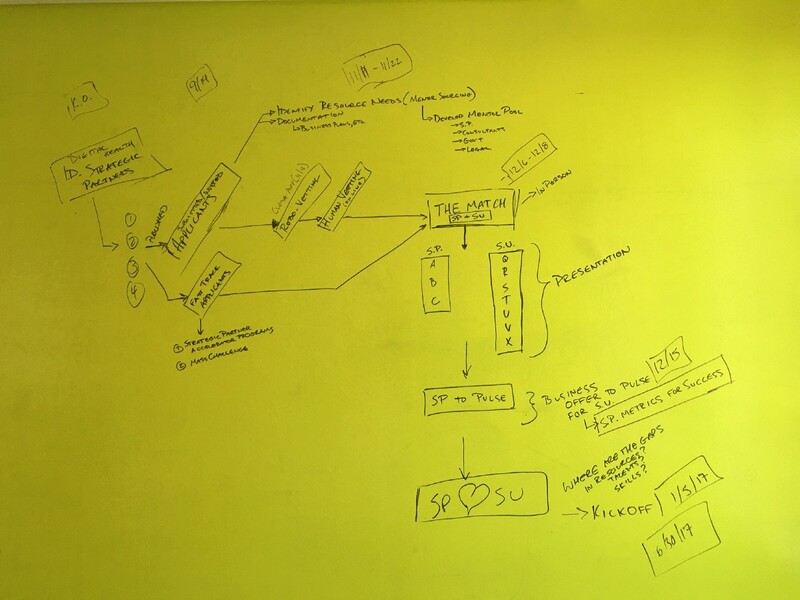 If you look to the image of our “greenboard,” you’ll see the original design of the PULSE program. SP❤️SU is shorthand for the output of our accelerator-matchmaker machine: the core of our program. This design produces real results. In 2017, PULSE’s matchmaking machine yielded over 80 partnerships and its 31 startups raised over $21M and earned over $4.5M during the program. While the scientist/engineer in me says the PULSE-influenced relationship between partnerships, funding, and revenue is not purely causal, the results support an assertion that the program attracted, selected, and supported great startups. For a good machine to function, it needs good inputs. We have some of the best. It is a requirement for PULSE Champions to submit their 3–5 strategic initiatives. We share them with you. We share them with the world. They are our north-star, aligning startups with our 20+ Champions so real work gets done in (shorter than) year-one. Digital health won’t work unless we collectively prove its value. PULSE’s demonstration projects are manufactured with a focus on value-creation. If you are a startup with a product and less than $5M in funding and $5M in revenue, we will solve these massive challenges together. Early bird deadline is September 15, 2017. Hear Challenges from AARP, Campbell’s Soup, Commonwealth of Massachusetts, and more! We believe when startups & patients win, we transform healthcare. Join our community & help us solve healthcare’s massive challenges. masschallenge.org.